Help! My math skills are abysmal for this !!! Thread: Help! My math skills are abysmal for this !!! I want to do a tessellation quilt, and I found one that I really like. http://waynekollingersquiltblog.blog...to-ponder.html These are the two blocks that I need to make. If you scroll down, you can see the four different blocks that you need to make. It's not really that hard when it broken down. Or so I thought! I have two set of strips. The strips were cut at 2 inches each. For the life of me, I can't figure out how to cut them. It looked so easy in the picture! Does anyone have any ideas? And, yes, feel free to laugh at my math skills! to me, and i haven't studied the link carefully, the larger triangle looks like the second half of the square after joining two of the smaller sized triangles together. How long were your original strips? They look much longer than they are wide, which caused your bigger triangle base than on the first triangle cut. It looks to me as though you need to cut strips into squares & then cut into triangles. So you can slide the smaller piece to be even with one edge of the larger, sew then square it now. For future ones, square the strips first & then cut into the triangles. I may be way off, because I do better if I physically try something out, but give this a try. The quilt is fascinating-just the kind of design I like! Thank you for posting the link. I would tackle it from a different angle since you are having a hard time visualizing what you need to do. 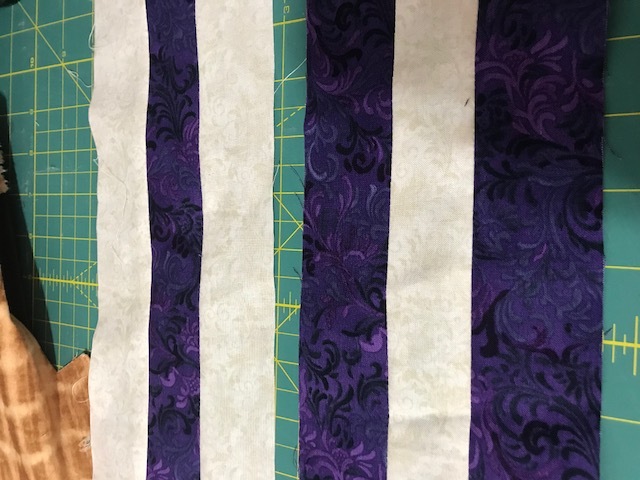 You are making HST's from your strip sets so cut out a piece of paper the size that you want your block to be plus 7/8 inch for a seam allowance. Cut it on the diagonal(I would draw the strip lines on in the direction that I want them to be just to make it idiot proof) and use that as a template or measure the paper. I mess up on mathing out things all the time so I try to make a visual safety check for myself. The strips are 42 inches long. a square would be 5.75 x 5.75 and when I cut that square into four triangles, I don't get what I need. I'm wondering if maybe 2 inches wide is not wide enough? I just did the math, & the diagonal of your first triangle is about 6.36”. The way to determine this is: A squared + B squared = C squared. Using the inches shown on your mat, 4.5(2) + 4.5(2) = 40.5. The square root of that is 6.36”. 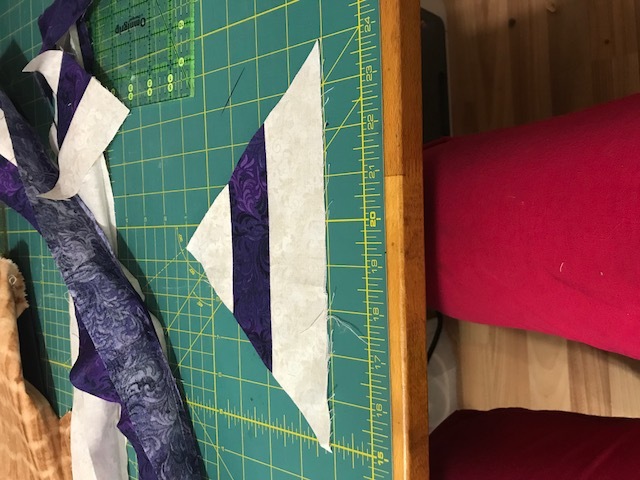 So my first suggestion seems to be wrong because you’re using the base of the 2nd triangle, which needs to be almost 2” longer than the base of the first. The diagonal of the 2nd is longer than its base. So ignore my first advice! Again, I’d need to try it out. 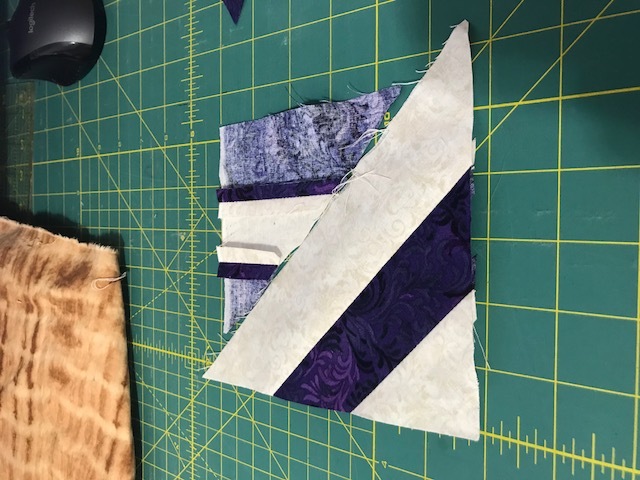 If I were to try it, I think I’d cut the strips 6.5” long, cut off that first triangle, set into the desired position & sew, squaring it afterwards. I hope I didn’t totally throw you off with my first mistaken post! Yikes! I’m sorry, I thought I was awake, but apparently I’m not. I think you will need 2 different strip sets for each. One with a light colour in the middle, one with a dark in the middle to cut the triangles with the stripe along the diagonal of your finished block. One strip set of each to be cut with the diagonal running across the strips. Good grief that isn't describing it well, sorry. If you look carefully at the 2 pictures of blocks that you have posted, you will see that the strips in the bottom left triangle are thinner than the ones in the top right. Basically, the strip sets for the 2 triangles are not the same size. I agree with Conchalea. The finished length of the diagonal of your 2" strip set will be 6.3" and the height will be about 3.18". You need to make a strip set that when finished, will match the height of the first triangle, 3.18". So the strips are going to need to be cut a 'strong' 1.5", or cut them 1.5", but use a slightly smaller seam allowance. Be sure to shorten your stitch length if you go this route. I would sure double check this by using some scrap fabric to cut the second strip set & make a test triangle. Unfortunately, this pattern doesn't lend itself to nice neat measurements. You might try to draw your completed square on paper and paper piece it. (Don’t forget your 1/4” seam allowance around the outside edges!) Do the half that is vertical to the diagonal first, then the ones parallel to the diagonal, starting in the center and working out to the corner. Last edited by Onebyone; 04-28-2018 at 06:29 AM. Here's the problem. You need 2 half-square triangles that are the same size. Every half-square triangle has 2 sides that are the same, and 1 side that is longer (the hypotenuse). Your strip sets have the stripes running in the same direction. Your cut triangles have the stripes running in opposite directions to each other. This is correct, as it is necessary for the design. However, your larger triangle has been cut so that its 2 short sides are equal to the 1 long side of the other triangle. 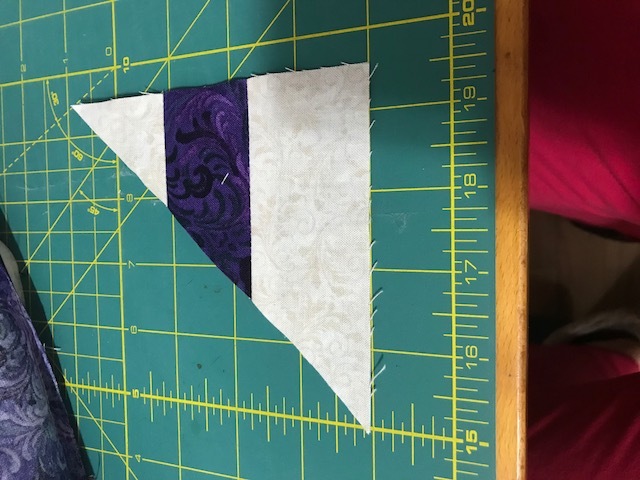 In short, what jillmc mentioned would give you the correct sizes of the two triangles (they would match); however, the stripe would be running in the wrong direction on one of the triangles. I think the solution requires you to make 2 strip sets of different widths, but that's as far as I've gotten. Will work on this some more later unless someone else comes up with the solution first. Edit: Oops. I think PaperPrincess has worked it out for you already. Last edited by Prism99; 04-28-2018 at 09:12 AM. Her is Waybpne’s email address....I bet he would be able to offer you some guidance! Thank you all ... the paper piecing idea was the best! I now have it working, pics to follow later! I am looking forward to seeing this Tesselation quilt made up. It's a nice quilt. I drew the quilt out in EQ7 using the same color scheme as in the picture. I spent hours on it. Trying to figure out how to turn the blocks and then realizing that some of them had the colors reversed. some had 2 different color backgrounds. Wow!!! This guy was a genius that figured out the original pattern. Maybe one day I will make one by my EQ drawings. Or maybe not. OMG I felt panic set in as I was reading Conchalea explanation, I felt like I was getting ready to take a test in Algebra after working all night. Whew it was a nightmare! LOL My eyes glazed over and my brain went numb. I can do math, but not that kind - I like to work it out with pictures hahahaha ... as soon as I saw the paper piece idea I smacked myself upside the head, since I love to PP and I have EQ7! 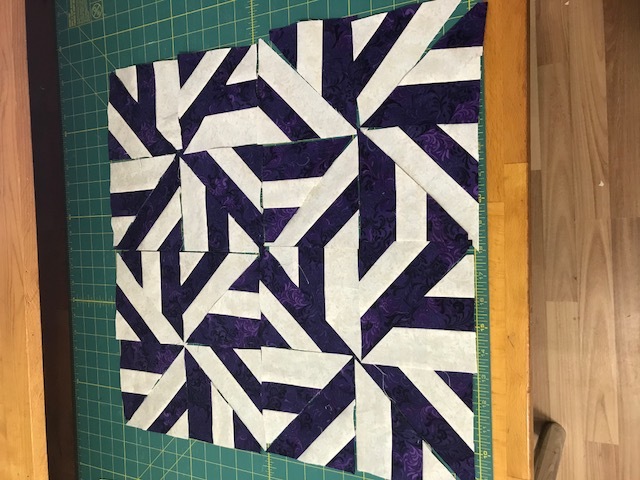 I am fascinated by this quilt, and I keep coming back to this post-can’t wait to see your paper pieced blocks! Found his book, and I believe the cover pic is this pattern in controlled scrappy version.....may have to purchase this! Here's what I have so far - not sewn together. I've always said 'math is of the devil'. hahaha! One of my dear Sunday School peeps - a middle school girl, recently told me M.A.T.H. stands for Mental Abuse Towards Humans. Now I'm gracefully(?) stepping away from the math question. That's the best thing about Electric Quilt - you can design all sorts of quilts without a commitment to making them. Keeps the brain active!